Hi Jenny – and thank you for inviting me to talk about my writing! I’ve written stories and poetry since I was very young, but it is only in the last couple of years that I have finally taken the plunge and decided to actually do something with my work. 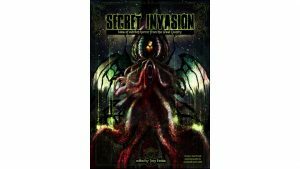 That all started in 2015, when I was invited to contribute a short story to Secret Invasion, a Lovecraftian-themed horror anthology which was being put together to raise money for MIND. I wasn’t hugely knowledgeable about Lovecraft’s work, so I decided to marry what I did know with my deep love of history. Thus, Dark Words was born. The story is told from two perspectives, one modern-day and one from the 1930s, as an archaeologist works on a site on Dartmoor and accidentally uncovers not only a dark and horrific secret, but also why an entire village was drowned beneath a reservoir in the late 1930s. It takes as its inspiration the terrible mind control of “Asenath Waite” from Lovecraft’s The Thing on the Doorstep and the various artefacts which lie unseen and quiet beneath the waters of the Fernworthy Reservoir, not far from Chagford in Devon. 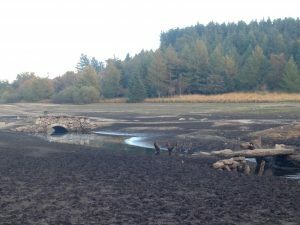 Having spoken to a few archaeologists and curators about the submerged bridges, hut circles and boundary markers, I found that no one really knows much about the village – so in Dark Words, I have given it my own back story, as well as explaining why so much archaeology should be lost beneath the waters of a reservoir. Believe me, it was for the best…. I’m delighted to say that Dark Words has been accepted in another anthology, Fairy Tales and Folklore Reimagined, which is due out shortly from Between the Lines, a publisher in Minneapolis. Something happened in 2016 which changed my perception of my writing forever. I accidentally became a playwright. In 2015, some friends and I had started Circle of Spears Productions, a professional audio production house and theatre company. Our initial focus had been on gathering authors and working with them to turn their books into audio. I thought it would be good if I could write something for us to perform for a summer season to build up the theatre side. Again, I wanted to blend my love of history into my writing, so I kicked a few ideas around and eventually hit upon the idea of preserving a moment in history by using the actual words spoken by those involved. I decided to try to use the words from a witch trial. This began a wonderful relationship with the fabulous team at the Museum of Witchcraft and Magic in Boscastle, Cornwall, who were incredibly supportive and helpful right from the outset and who introduced me to the woman who has since become an obsession for me. In Lyme Regis, Dorset, in 1687, a woman named Deanes Gimmerton went on trial for witchcraft. Hers is one of the most complete written records of an English witch trial. The papers consist of four pages of witness evidence from one of her ‘victims’, his parents and the mother of a second ‘victim’, who had actually died two years previously as a result of being ‘bewitched’. What fascinated me the most, however, was the fact that the accusation had arisen after Deanes shared a pipe of tobacco with her young victim. A simple, everyday action that she probably didn’t think twice about and yet which had such staggering consequences. 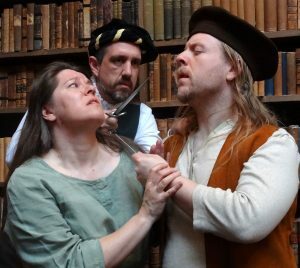 My play WITCH tells Deanes Gimmerton’s story using three fictitious characters – Margery Scrope, the accused, Thomas Latimer, her accuser and Sir William Tyrell, the landowner-magistrate who has to evaluate the accusation to see if it should proceed to trial. However, as there was so little of Deanes herself in the papers – no indication of a plea or a verdict – I needed to research more widely to build Margery’s character and she ultimately became an amalgamation of the experiences of Deanes and about seven other women. WITCH was originally intended to run for a summer season at the Museum of Witchcraft and Magic (and a more fitting venue I cannot imagine). However, over the course of the summer of 2016, something changed. At our second performance, we were asked if we used it as Theatre In Education and this resulted in our first school booking. Since its premiere in July 2016, we have performed WITCH 54 times and have dates booked for 2018 already. WITCH has become its own entity and that, I think, is because it tells not just Deanes’s story, but the story of all the women – and men – like her, who found themselves accused of witchcraft as a result of some ordinary, everyday action like sharing a pipe of tobacco. I am delighted to have been given a contract by Troy Books in Cornwall to expand on the research I did for WITCH and write a book about it. I have been looking further into Deanes’s story to try to find out what happened to her, but she is frustratingly invisible in the historical record. 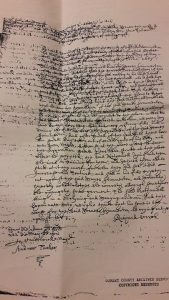 As I write this, I have just ordered a couple of documents from the National Archive, where I am spending the day on Friday of this week, to try to find some mention of Deanes in the legal records of 1687 and hopefully discover her fate. I am incredibly excited at the prospect of seeing the original court documents in the flesh, but as Deanes has been a huge part of my life for so long, I know that it will also be an incredibly emotional moment for me if the information I am seeking is actually in those documents. So what leads on from witch trials? Well, for me, it was dragons. I have always been a rather eclectic writer and am totally unable to stick to just one subject or genre, so I followed WITCH by self-publishing a story I wrote for my daughter when she was about three years old. She is now ten, so it was about time something happened to this particular story! 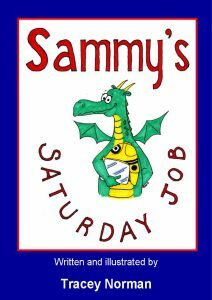 Sammy’s Saturday Job is the tale of a little dragon who desperately wants to be a firefighter, but when she finally gets the chance, everything goes wrong. She has to think creatively and persevere in order to put things right and save the day. And now? Well, now it’s elves. And more dragons. The dragons haven’t appeared yet, but it’s high fantasy, so it won’t be long before they show up. At the moment, though, I am having some difficulty in persuading my elves to stick to the chapter plan. As someone who, in the past, just sat down and wrote with no plan anywhere in sight, the fact that I actually took the time to plot an entire book is nothing short of miraculous, so the elves really do need to get with the programme. This is the first in a projected series of books about a young elf who turns her back on the life her influential family has mapped out for her and follows her as she travels the length of the Empire in which she lives, learning new skills and trying to find a place where she belongs. The central character is my gaming alter ego, who, again, has been with me for a long time and whose back story I really wanted to explore. However, when I was planning the first book, The Battle for Dragonheart, I realised that it was not her story that I needed to tell, but her mother’s. Then, as I started that story, I realised that it wasn’t her mother’s story, either – not entirely. A completely new character made herself known and Dragonheart, the first of The Fire-Eyes Chronicles, is her story. I would have loved to be able to take part in this year’s NaNo, but unfortunately, I have to grab my writing time whenever and wherever I can in between everything else I do, so the chances of me reaching 50, 000 words in a month is, sadly, highly unlikely. However, I do have the advantage of being a member of the Exeter Authors Association, which provides me with plenty of opportunities to discuss my writing with other authors and the 2018 programme of events we have put together will certainly encourage me to ensure that Dragonheart is finished sooner rather than later. There are a number of books to plot in the Fire-Eyes series, as well as a bunch of rather interesting (non-sparkly) vampires waiting in the wings and periodically trying to grab my attention. It looks like 2018 will be a very busy year…. 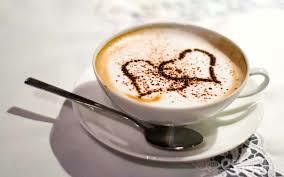 Thank you ever so much Tracey- fabulous blog.